Choosing a suitable, systematic way to collect and organize the data. This could include constructing tables, two-way tables, or frequency charts. Interpreting their own and others’ findings clearly and effectively. Before the lesson, students work individually on an assessment task designed to reveal their current understanding and difficulties. You review their responses and create questions for them to consider when improving their work. At the start of the lesson, students reflect on their individual responses and use the questions posed to think of ways to improve their work. They then work collaboratively in small groups to produce, in the form of a poster, a better strategy to the task than they did individually. In the same small groups they implement the strategy. In a whole-class discussion students compare and evaluate the different strategies they have used. Working in the same small groups, students analyze sample responses to the task. 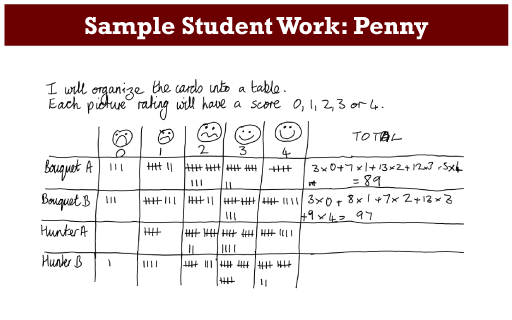 In a whole-class discussion, students review the methods they have seen. At the end of the lesson or in a follow-up lesson, students reflect individually on their work. Each student will need a copy of the assessment task: Testing a New Product, a sheet of paper, and a copy of the How Did You Work? review questionnaire. Each small group of students will need two large sheets of paper for making a poster, the cut-up sheets Results of the Survey: Data Sheet 1, 2, 3, and 4, some felt-tipped pens and copies of the Sample Responses to Discuss. Provide rulers and graph paper for students who choose to use them. 15 minutes before the lesson, a 100-minute lesson (or two shorter lessons), and 10 minutes in a follow-up lesson (or for homework). Timings are approximate.